Josh Allen hasn’t conceded anything. He even put a halt — at least temporarily — to the growing assumption that USC quarterback Sam Darnold will be the Browns’ choice with the No. 1 pick in the draft. 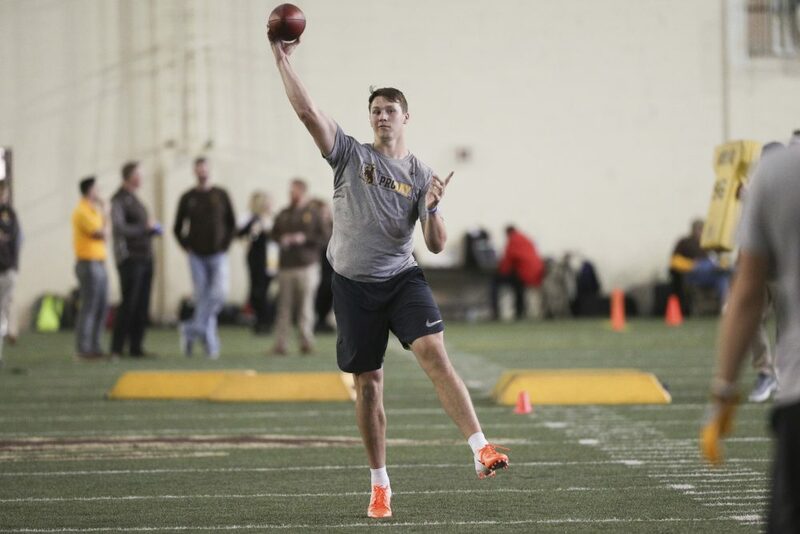 Allen, the Wyoming quarterback who looks like he was built in a laboratory and has the rocket right arm to match, put on a display Friday at his pro day in the indoor facility in Laramie. The Browns were there to witness it, starting with owner Jimmy Haslam. He also watched Darnold’s pro day Wednesday in Los Angeles and has been in the meetings with the potential top picks as the organization searches for the answer to the decades-old quarterback question. General manager John Dorsey, coach Hue Jackson and assistant GM Eliot Wolf were spotted on the field, and Jackson shook Allen’s hand and gave him a hug when the 60-throw session was over. They saw a special arm. Allen (6-foot-4 7/8, 237 pounds) showed off the arm with darts on deep comebacks and rainbows that stretched 80 yards. Playing quarterback isn’t all about who throws it the farthest or hardest. The ball must arrive at its target and on time, which are areas Allen struggled with in college. “It’s no secret he can throw the ball through the carwash without it getting wet and can throw it out of the gym,” personal coach Jordan Palmer said. “But we really wanted to tempo the ball, control it. He completed just 56.2 percent in two years as the starter at Wyoming and was plagued by some ugly misses. He and Palmer have concentrated on his footwork, believing that’s the reason for the inconsistency in his throwing. Allen could finally exhale Friday. Allen missed high on a few throws and overthrew a few more but continued the progress that was obvious at the scouting combine. Allen has also worked on throwing with more touch. He would get erratic when he tried to take some heat off the ball. Allen hasn’t thrown against a defense in months, so the improvement must be taken in context. Darnold had a strong showing in the rain two days earlier and generated a lot of buzz that the Browns had locked in on him at No. 1. Palmer coaches him and Allen and isn’t taking sides. “Physically one’s bigger, one’s got a stronger arm,” Palmer said of Allen. “Sam has anticipation like I haven’t seen. Darnold’s more polished than Allen, despite being a year younger at 20. But it’s fair to wonder if Allen has more potential that could be realized a couple of years from now in the NFL. Palmer raved about his character, leadership and intelligence. “I think we’re going to get to a point with this player where his arm talent is the second or third thing we say about him and that’s special,” he said.